In the roiling cauldron that is the business environment today, a number of mega-forces are responsible for creating wicked problems. Globalization brings complexity and uncertainty, while innovation creates new and unfamiliar realities, unprecedented situations, and potential conflict. And, when the two interact, the result can be disruptive technologies. Research has suggested that disruptive innovations arise from addressing low-end markets or from the creation of entirely new markets. Globalization creates the context in which low-end markets are found and entirely new markets can be conceived. The resulting disruptive innovations and related technologies in turn create the need and the opportunity for new business models. I have found that a number of specific practices – which I call “Wicked Strategies” – will enable organizations to transmute disruption and chaos into cash flow. One of these practices is to integrate social responsibility into the business model. A wonderful example of this can be found in Arvind Limited, a global textile manufacturer based in India that reduced the incidence of cotton farmers committing suicide – a tragedy that is all too common in India. The farmers who were most at risk worked on non-irrigated land, dependent on monsoon rains. They borrowed money to pay for expensive, genetically-modified, pest-resistant seeds, and for fertilizers and pesticides. If successive monsoon rains failed to occur, the farmers were likely to be unable to pay back the money they borrowed, and their land would be forfeited to the moneylenders. With no ability to make an alternative living, farmers and their families often chose suicide to slow death by starvation. Arvind, a public limited company, which began as a textile manufacturer, has a fourth-generation scion of the founding family as its CEO. Arvind’s reputation for implementing leading management practices has made it the focus of several case studies that are discussed in management schools in India. Every generation of the family has been recognized for its commitment to social responsibility, a commitment that has seen a progression from personal giving, to corporate giving, to professionally managed philanthropic trusts funded by the company, to the current generation’s innovative and surprisingly profitable incorporation of social responsibility into business models implemented by Arvind. Motivated by their concern for the farmers, and by the company’s and its major customers’ (including Walmart and Patagonia) avowed commitment to environmental and social sustainability, Arvind’s CEO and senior executives brainstormed a possible response to the farmers’ precarious circumstances. The answer they came up with was to teach and enable the farmers to engage in organic cotton farming. Organic farming, they believed, would get farmers out of the clutches of moneylenders because organic farming is fertilizer- and pesticide-free. Even the cost of cotton seed was significantly reduced because expensive genetically modified seeds were not employed. Arvind’s project took enormous commitment, a great deal of courage, some creativity, and rigorous planning and analysis. A detailed business plan was developed. The company recruited 130 agronomists and embedded them in the villages to offer scientific counsel tailored to each farmer’s small plot of land and fundamentally change traditional farming practices. Arvind also assumed control of the value chain surrounding the farmers’ activities, eliminating avaricious and exploitative middlemen. But in order to achieve this splendid success – and this is the point that warrants emphasis – Arvind’s executives truly had to become one with the farmers. The son of the CEO, a Yale-educated, immensely advantaged fifth-generation scion of the founding family, spent time in the villages. The head of Arvind’s agribusiness also lived in the villages. Through these experiences, they understood the hardships and challenges faced by the local population. It is impossible for anyone unfamiliar with rural India to understand the resolve it takes for someone used to middle-class levels of comfort, let alone a person of privilege, to endure the conditions of living in a poor village. Arvind took their efforts to understand the local population to extreme lengths. Beyond helping farmers to protect their lives and livelihoods, Arvind also protected the environment, engaged diverse stakeholders, enhanced its competitive position and standing with major international customers, and added significantly to its coffers. The moral is that Arvind’s leadership became one with the farmers and the resulting tale of disruption, increased economic value added, and social benefit is illuminating and inspirational. It bears mention that the benefit to Arvind soon extended beyond the organic farming project. Responding to the need to rotate crops to keep the soil fertile, Arvind helped the farmers grow and market food crops, alternating with organic cotton. Observing the profitability of food crops and having agronomists in its employ, Arvind moved swiftly to buy fields, grow food crops and initiate a new agribusiness division, which has become an important and growing element of the corporate portfolio of businesses. Arvind has committed to and replicated the practice of incorporating social responsibility into business models to create disruptions and innovatively enhance both economic value and social benefit. One of these innovative businesses is real estate development and housing for slum dwellers. Another involves teaching tailoring skills and providing safe and comfortable housing to economically and socially disadvantaged young women, to ease Arvind’s entry into the Indian garmenting industry, which is challenged by highly restrictive labor laws. By offering a socially responsible “learn and earn” program that helped a disadvantaged segment of society, Arvind was able to minimize the contingent liabilities that are characteristic of the volatile, global garment industry. Often, what appears to be a dire threat to an organization can, with a ton of courage and a modicum of creativity, be alchemized into a powerful and generous source of competitive advantage and added economic value. Incorporating social responsibility into the business model is one important avenue whereby this can be achieved. 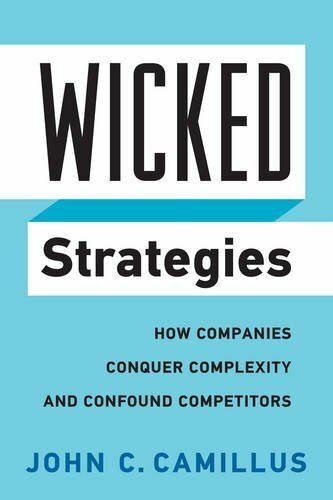 John C. Camillus is the author of "WICKED STRATEGIES: How Companies Conquer Complexity And Confound Competitors" (Rotman – UTP Publishing), and the Donald R. Beall Professor of Strategic Management at the University of Pittsburgh. He has served as consultant on strategic management to over 100 organizations on four continents, including many Fortune 500 companies.